(17/P6) TRENTON – Department of Environmental Protection Commissioner Bob Martin today joined federal and state lawmakers, leaders of the state’s recreational and commercial fishing industries, anglers, and people whose livelihoods rely on fishing to rally in opposition to proposed drastic recreational harvest reductions for summer flounder, saying the changes would devastate the state’s fishing industry and have far-reaching economic impacts on shore tourism. The rally follows votes last month by the Atlantic States Marine Fisheries Commission (ASMFC) and the Mid-Atlantic Fishery Management Council (MAFMC) that would likely result in an increase in the size of individual summer flounder anglers can keep, as well as a decrease in number of fish that may be kept each day, and a reduction in season length. One of the options under consideration could reduce New Jersey’s recreational harvest limit for summer flounder by as much as nearly 50 percent. Summer flounder is one of the most popular game fish in the state among recreational anglers and is very important to commercial fishing operations. 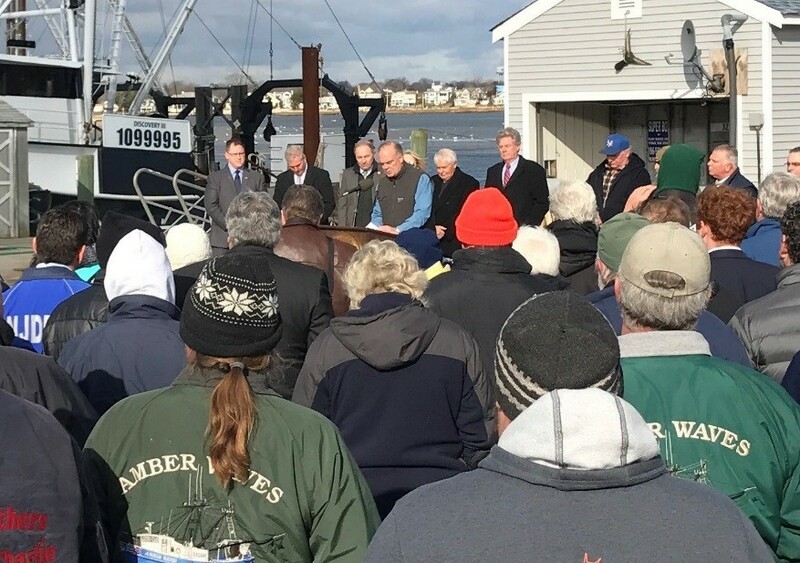 Commissioner Martin insists that sound science must drive decisions to balance protection of the summer flounder resource and the needs of the recreational and commercial fishing industries, which generate about $2.5 billion annually in economic benefits for the state. He wants 2016 size limits, catch limits and season lengths be kept in effect for 2017 pending a more thorough review of scientific data. Other options the ASFMC is considering range from reductions of 28 percent to 41 percent. Any reduction for 2017 would be on top of a 27 percent reduction New Jersey has had to implement after successfully fighting off a proposed 59 percent reduction in 2015. Among the federal and state lawmakers joining Commissioner Martin were U.S. Rep. Frank Pallone, whose district includes the northern coastal portion of the state, and Monmouth County Assemblyman Dave Rible. These lawmakers have also taken strong actions to oppose the measure. Fishing advocacy groups that have been actively opposing the measure include the New Jersey Outdoor Alliance, the Recreational Fishing Alliance, the New Jersey Coast Anglers Association, the New Jersey Federation of Sportsmen’s Clubs, United Boatmen and the Save the Summer Flounder Fishery Fund. Commissioner Martin plans to testify against the proposed quota changes during the ASMFC meetings scheduled Jan 30 through Feb. 2. ASMFC is poised to formally adopt one of five general management approach options that could range from coast-wide harvest reductions to more localized regional reductions. After these meetings, the Commission will instruct the states on how to achieve the reduction targets. Fishery managers use a combination of individual fish length, daily catch limits, and season length adjustments to achieve harvest reduction targets, or quotas. Commissioner Martin said that past management of quotas for recreational and commercial fishing industries have been much too capricious, varying widely from year to year and leading to great uncertainty in both industries, as well as competitive disadvantages to New Jersey. Commissioner Martin recently submitted comments to the ASMFC formally opposing the changes. In the long term, New Jersey strongly recommends that members of ASMFC work in coordination with the federal government to create a new paradigm regarding the management of this species,” Commissioner Martin wrote in his comments. “If the purpose of ASMFC is to protect the flounder stock while also providing equitable harvest limits for the recreational and commercial fishing industry, then annual quota shifts that are not based on the most recent science and modeling are of questionable value. Recreational fishing in New Jersey alone directly creates some 20,000 jobs and contributes $1.5 billion to the state’s economy, with commercial fishing generating another billion dollars in economic benefits. The ASMFC was formed in 1942 by an interstate compact ratified by Congress to manage key nearshore fish species from Maine to Florida. Each state is represented by three commissioners – the director of each state’s fisheries management agency, an individual appointed by the governor to represent stakeholder interests, and a state legislator. Commissioner Martin stressed that a more thorough scientific analysis of summer flounder, also known as fluke, should include a peer-reviewed assessment of data gathered by a variety of sources, including the National Oceanic and Atmospheric Administration’s Marine Recreational Information Program, a detailed survey of anglers. Commissioner Martin offered the state’s resources to help develop a new benchmark assessment. The summer flounder season in New Jersey typically runs from May through September, concurrent with the peak tourism season. Current New Jersey regulations allow recreational anglers fishing in most parts of the state to keep summer flounder that are at least 18 inches long, at a maximum of five fish per day. In Delaware Bay, anglers may take up to four summer flounder per day that meet a minimum 17-inch length requirement. The DEP is particularly concerned about any regulatory changes that would increase the minimum length of fish caught in New Jersey because few fish would meet the larger size limit. Summer flounder in New Jersey tend to be smaller than in states to the north due to the species’ biological needs and migration patterns. Moreover, coast-wide more than 90 percent of summer flounder that are greater than 18 inches in length are females, meaning an increase in size limits would encourage higher harvests of reproductive fish, which is counterproductive to sound fishery management. Summer flounder fishing is especially popular in New Jersey, attracting many thousands of anglers each summer season because of the abundance of these fish close to beaches and in bays and creeks. They are considered a delicacy due to their delicate flavor.